Round leafed sundew in bright sunshine, her tentacles fully extended. The secret life of Ireland's bogs will be revealed in a new exhibition in Mountbellew next month. The Galway Teleworks community building at Mountbellew Co-op is showcasing some of the wild and wonderful life of Irish bogs, courtesy of ‘The Living Bog’ project. The photos were taken by acclaimed nature photographer and author Tina Claffey, whose recent book Tapestry of Light from Galway-based publisher Artisan House has been a resounding success - President of Ireland, Michael D Higgins, has a first edition in his library and one of Claffey's prints on his wall at the Áras. Claffey was drawn to Ireland’s remaining raised bogs when she returned to the Irish midlands after living and working in Botswana, Southern Africa, for almost a decade. She says the exotic flora and fauna of an Irish bog is even better than what she found in the wilds of Africa, with unique species totally dependent on the bog. 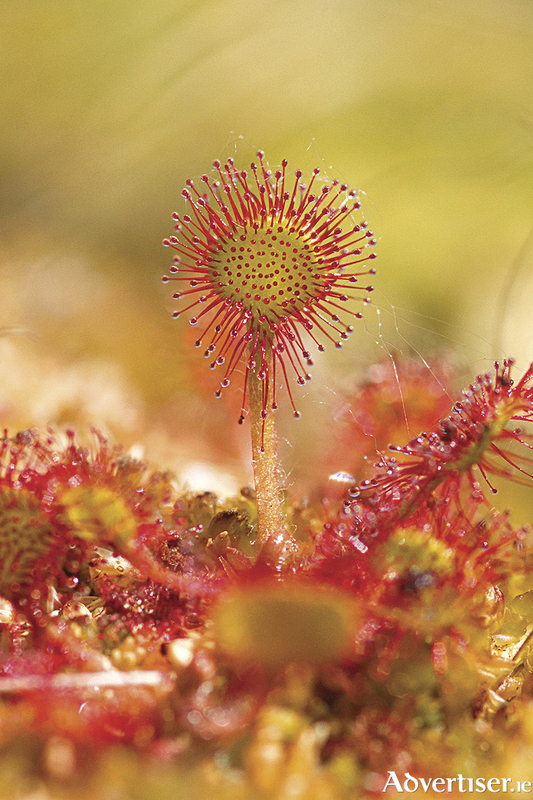 One such species is the flesh-eating sundew which survives on insects. In specialising in micro-photography, Claffey is required to sit patiently, lie down, or climb up to wait for the moment. Her work has featured at several exhibitions over the past few years, and has been on the BBC and in the Guardian newspaper in the UK. Running until the Mountbellew Show on September 15, it is the first of many bog-related events set to take place at the Galway Teleworks building, which is to be the hub of Carrownagappul Bog Special Area of Conservation (SAC ) - ‘Galway’s Living Bog’, which is just outside Mountbellew. It is one of 12 bogs currently being restored by ‘The Living Bog’ project, which is funded by the EU’s LIFE programme and co-funded and administered by the Department of Culture, Heritage and the Gaeltacht. Working with the local community in Mountbellew, the project is planning to upgrade walking paths and provide community-led visitor amenities on the bog over the next three years. There will also be an interactive display area developed at the Galway Teleworks building, and hopes are high the new tourism offering will bring in many visitors to the area to celebrate Galway’s Living Bog. Carrownagappul Bog SAC is one of Europe’s largest remaining, relatively intact raised bogs. At 487 hectares it contains one of the largest extant areas of uncut high bog surface in east Galway.